Williams has researched and written extensively on her Lassiter family of Randolph County, North Carolina. Her first book, published in 2011, “Miles Lassiter (circa 1777-1850) An Early African American Quaker from Lassiter Mill, Randolph County, North Carolina: My Research Journey to Home” (Backintyme Publishing), told the story of both her personal and research journeys that led to the discovery of her fourth great grandfather, Miles Lassiter. 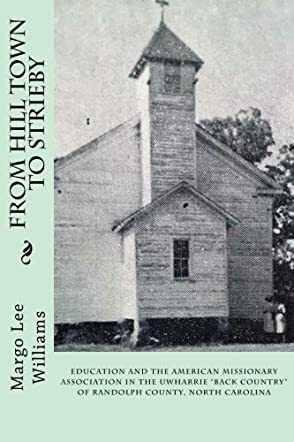 Williams' second book, published in 2016, “From Hill Town to Strieby: Education and the American Missionary Association in the Uwharrie ‘Back Country’ of Randolph County, North Carolina” (Backintyme Publishing), picks up where her first book left off. “From Hill Town to Strieby” is a social history that follows the development of the school and church, founded in 1880 by a mixed race, former slave and 19th century poet, the Rev. Islay Walden. The church and school served the Lassiter Mill and Hill Town/Strieby communities of color in southwestern Randolph County. Her research led to the Strieby Church, School and Cemetery property being named a Randolph County Cultural Heritage Site in 2014. Both of Williams' books have won genealogy and history book awards. From Hill Town to Strieby is Margot Lee Williams’s second book on this era, a continuation of her story about Miles Lassiter, an African American Quaker ancestor of hers. All I can say is wow! This is one interesting story, full of useful facts, and I loved the photos; they really brought the story to life even more. This was quite an important historical time and Margot’s research into it is second to none. She has provided a highly informative account of history that will now live on in the hearts and minds of her family, both close and extended. She wrote this book in a way that made it very easy to follow, both interesting and lively, with her descriptions bringing both the place and the people to life once again. This is a good book for anyone who wants to get involved in researching their family history – it will show you how it's done!